First get-together Monday 15th September, 7:30pm at the Royal Oak, Spital Street Dartford. About a year ago I was prompted, by nothing more than some overlapping Twitter conversations around Dartford, to suggest a real world get-together. So #dartfordtweetup was born. It didn’t have a set purpose or agenda – my intention was that this would just emerge. We have met most months since then and ranged from about 10 to 15 participants. Some very important connections were made, and projects started, which wouldn’t otherwise have happened. But we have often talked amongst ourselves about two things. What is it now for? Why hasn’t it grown? [The second question alternates with whether we want it to grow – just for the sake of it]. We also did a bit of unscientific market research about what people might want or expect from it, and what puts them off. We are still happy that the purpose of these gatherings might change and evolve in response to the people who choose take part. But here’s a suggestion. 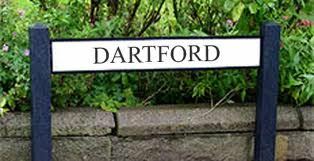 There are several different groups in Dartford which either exist on the internet [not least on Facebook] or use the internet to connect and organise people to do things offline. There are some groups that would like to do more in this way. What all of them have in common is Dartford… anything from just living here, to being curious and concerned about what goes on here, to having active plans to influence and grow our community and culture. These include, Dartford Remembered, Dartford Past Present and Future, Dartford Matters, Dartford Living, Dartford Community Group, Dartford Arts Network, Dartford Litter Pickers, Dartford Mens Shed, Dartford Big Local, Dartford Park Run and Dartford Round Table. The idea of Dartford Natters [working title :0) ] is that it tries to reflect *offline* the way that, for example, the Dartford Matters blog and social media feeds combine news, information and opinion from as many local sources as possible. We also found that the label “#tweetup” gave a lot of people the impression that the sessions were all and only about Twitter – which a lot of people don’t use, or still find odd and not always pleasant. Quite a lot of other “#tweetups” around the UK are also mainly for businesses. So we want to make it clear that whilst Twitter was the trigger, and the channel we first used to organise meets, we have quickly found ourselves widening the scope. We would like as many people as possible who are organisers or active participants in those groups to come along on September 15th. The point? Just to connect, share ideas and intentions, meet new people and have an enjoyable evening. We may discover things that we can link online, share or plan together. But that can all come out in the wash.
I’ll be getting updates out via Dartford Matters too, and contacting as many of these groups’ patrons, admins and officers as I can directly. But we’re still open to anyone and everyone. Hope you can come. ← Dartford [Summer] Tweetup. Friday 25th July. St Edmund’s Pleasance.